Kaaterskill Falls in the Catskill Mountains near Catskill, New York. 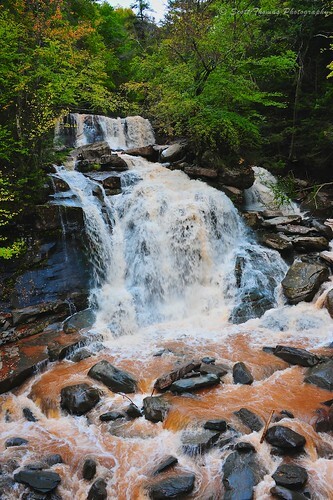 This waterfall is right off of Route 23A between Catskill and Hunter Mountain. There is a parking area nearby and you walk down to these falls along the road. Not the safest trek but manageable. The water is brown from runoff from an overnight rain and mudslides. A quarter mile down the road from here is a temporary traffic light for a one lane stretch where half the road has caved in. All effects from Hurricane Irene in late August. This entry was posted in Nature and tagged 28-300mm, autumn, brown, catskills, creek, flow, hurricane irene, kaaterskill falls, mountains, new york, nikon D700, park, rocks, stream, vr, water, waterfall, wild, wilderness. Bookmark the permalink. Great picture! I love how the water turns a muddy red at the bottom! The heavy slit in the water does give this waterfall photo more interest. Thanks for stopping by Maggie! Beautiful shot. The red water gives it an interesting twist. I know you have seen your rivers this color. Normally but this time of year, the water is much clearer but the hurricanes in August caused a lot of mudslides and extensive flooding causing all the run-off. Great shot! I think the brown water adds interest. Did you try one with slow shutter speed, too? Do to circumstances (late in the day and driving home), I did not get out the tripod. I did do some slower shutters hand-held. Yes, the muddy water looks beautiful at the bottom. I am wondering if you somehow edit that in Photoshop to make it stand out like that? The water looks brown?! I’d use one of the following for such a beautiful color: terra-cotta, apricot, tea. Or better yet: apple cider.